Lady Gaga, will.i.am, R. Kelly, George Winston, Kronos Quartet, Sony Playstation (3 games), HBO films upcoming feature with Nicole Kidman and Clive Owen called Hemmingway & Gellhorn, and countless local artists. 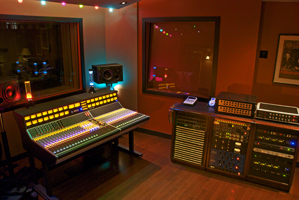 Located in the heart of San Francisco's hip SOMA district, Studio Trilogy offers engineers, producers and artists one of the worlds finest recording environments designed by John Storyk. The facility houses three state-of-the-art control rooms, four integrated isolation booths, a versatile large tracking rooms, and an experienced staff. an enviable collection of analog gear like Pultec EQ's, Neve compressors, and an EMT 140 plate. Studio D Control room is attracting a lot of in-the-box work as well as post production work. The studio has hosted Japan punk band Vamps with New York Citybased engineer Josh Wilbur; producers Rob Garza and Fred Rubens (Thievery Corporation); Island/Def Jam artist Adrienne Bailon with producers Rock City and Jevon, and renowned pianist George Winston. Studio Trilogy features; Pro Tools|HD 3 systems and classic Studer analog 2" tape, Ampex ATR 1" and 1/2"
2 Track, A 32 Channel API 1608; A Digidesign ICON D-Control, ISDN, Video link and monitoring for scoring to picture, overdubbing, voice-over, sound design, a large collection of microphones; a full complement of vintage and modern instruments and gear. 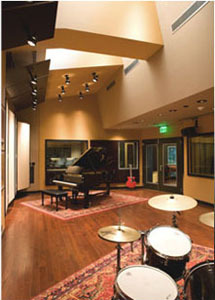 The studio was originally opened in 2006 to serve as an in-house studio for an independent record label. In April of 2010 Cindy McSherry, Justin Lieberman (Carlos Santana, Alanis Morisette, New Order, Willie Neslon), and Willie Samuels (Greenday, Radio Suicide), took over management of the studio facility and renamed it Studio Trilogy. 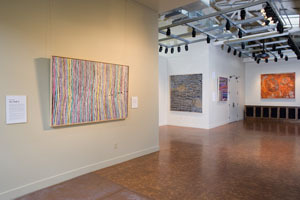 It now operates as a traditional studio-for-hire facility. The team are all veterans of the Bay Area studio scene having held past engineering and management positions at Different Fur, SF Soundworks, Crescendo! 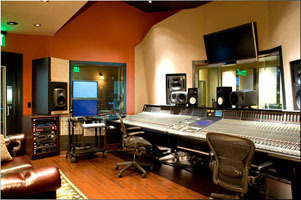 Studios, Russian Hill Recording, Nu-tone, and Studio 880. "At Studio Trilogy we offer flexibility and consistent quality of service to every client. 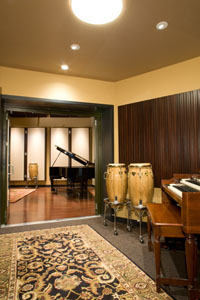 Three unique rooms allow us to satisfy a diverse clientele.The combination of our gear collection, the comfortable and creative lounge spaces, and the attention to detail that we give every single project that walks through the door, makes Studio Trilogy a really unique and inspiring place to work," says Justin Lieberman, chief engineer. Who has been recording at Studio Trilogy lately? Brain (Guns 'N Roses), Primus, Tom Waits, Praxis, Mirv, (Limbomaniacs), Justin Bieber, George Winston, Mike Clark (Herbie Hancock, Vince Guraldi Trio, Betty Davis, George Benson). Most agree, San Francisco is a creative city with a large art community, numerous and diverse restaurants and a vibrant music scene. 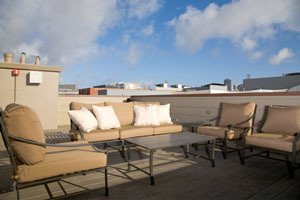 Now there is a studio in the city by the bay that rivals any other in the world. 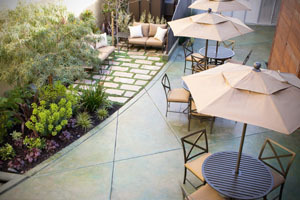 In addition to a variety of recording spaces, the 6,000-square-foot facility also boasts a number of comfortable lounges and play spaces, including a backyard garden and bbq area, rooftop deck, playroom, and a beautiful apartment for guests.